According to OECD group of the aid donor nations, the words "aid" and "assistance" refer to flows which qualify as Official Development Assistance (ODA) or Official Aid (OA). Such OA or ODA aid includes both grants and soft loans given by OECD nations and multi-lateral institutions like the World Bank, Asian Development Bank, IMF, etc. Britain will spend over $1.5 billion during the next three years in aid to Shining India, a nuclear-armed power that sent a spacecraft to the moon recently, to lift "hundreds of millions of people" out of poverty, the British secretary of state for international development said last November, according to the Guardian newspaper. "Under the strategy, the bank will use lending, dialogue, analytical work, engagement with the private sector, and capacity building to help India achieve its goals," the World Bank said on its website. The International Bank for Reconstruction and Development would lend $9.6 billion and the International Development Association would make available $4.4 billion of funding, according to India's Financial Express. Only 30 per cent of India's state highways have two lanes or more, and the majority are in poor condition, the bank said. Electricity generation capacity has grown at less than 5 per cent in the past five years, much slower than overall economic growth of about 8 per cent over the same period. The funds would also be used to help reduce poverty in seven low-income states; Bihar, Chhatisgarh, Jharkand, Madhya Pradesh, Orissa, Rajasthan and Uttar Pradesh, the World Bank said. According to Japan's ministry of finance, India has received $33 billion in soft loans and a billion dollars in grants from Japan since 1997. In 2008, Japan gave India $2.5 billion in soft loans, and $5 million in grants. By contrast, Pakistan has received $10 billion in soft loans, and $2.3 billion in grants from Japan since 1999. In 2008, Japan gave Pakistan $500 million in soft loans and $63 million in grants. There is widespread hunger and malnutrition in all parts of India. India ranks 66th on the 2008 Global Hunger Index of 88 countries while Pakistan is slightly better at 61 and Bangladesh slightly worse at 70. Indian media's headlines about the newly-minted Indian billionaires need to bring sharper focus on the growing rich-poor gap in India. On its inside pages, The Times of India last year reported Communist Party leader Sitaram Yechury's as saying that "on the one hand, 36 Indian billionaires constituted 25% of India’s GDP while on the other, 70% of Indians had to do with Rs 20 a day". "A farmer commits suicide every 30 minutes. The gap between the two Indias is widening," he said. Over 1500 farmers committed suicide last year in the central state of Chhattisgarh alone. Among the Asian nations mentioned in an October 2008 UN report, Pakistan is more egalitarian than the India, Bangladesh, China and Indonesia. Based on all the UNDP data, Pakistan does not have the level of hunger and abject poverty observed in India or Bangladesh. In 2006 a commission appointed by the government revealed that Muslims in India are worse educated and less likely to find employment than low-caste Hindus. Muslim isolation and despair is compounded by what B. Raman, a hawkish security analyst, was moved after the most recent attacks to describe as the "inherent unfairness of the Indian criminal justice system". Ironically, there are some parallels here between the violent Maoists movement in India and the Taliban militants in Pakistan, in spite of their diametrically opposed ideologies. Maoists say they are fighting for the rights of neglected tribal people and landless farmers, as are the Taliban in FATA and NWFP. Though their tactics vary, both movements have killed dozens of people, including security personnel, in the last few weeks. Both movements control wide swathes of territory in their respective countries. Both continue to challenge the writ of central or provincial authorities. I have always been intrigued by Kerala and I wonder if there is a Kerala model that could be replicated in the rest of South Asia. With the exception of Kerala, the situation in India is far worse than the Human Development Index suggests. According to economist Amartya Sen, who won the Nobel Prize for his work on hunger, India has fared worse than any other country in the world at preventing recurring hunger. In addition to its high literacy rate, Kerala boasts one of India's best healthcare systems, even for those who can't afford to pay user fees and therefore depend on government hospitals. Kerala's infant mortality rate is about 16 deaths per 1,000 births, or half the national average of 32 deaths per 1,000 births. Freelance journalist Shirin Shirin thinks Kerala's success has something to do with the fact that communists have ruled Kerala for much of the past 50 years. The CPI(M) successfully pushed for three major reforms in the 1960s and 1970s. The first and most important was land reform. While nearly everyone looks on land reform as a huge success in Kerala, the policy was controversial when it was first proposed in 1959. Land reform, after all, is an attack on one of capitalism's founding principles - the right to property. The central government intervened and effectively blocked the implementation of land reform for 10 years. But planners and unions in Kerala understood that building a more egalitarian economy required attacking the old feudal system at its roots, and small farmers weren't going to stand for anything less. But even Shining Kerala is plagued by hunger and malnourishment, just as the rest of India. The first India State Hunger Index (Ishi) this year found that Madhya Pradesh had the most severe level of hunger in India, comparable to Chad and Ethiopia. Four states — Punjab, Kerala, Haryana and Assam — fell in the 'serious' category. "Affluent" Gujarat, 13th on the Indian list is below Haiti, ranked 69. The authors said India's poor performance was primarily due to its relatively high levels of child malnutrition and under-nourishment resulting from calorie deficient diets. "World Bank considering to raise sovereign borrowing limit"
Reads the reference of yours in times of india. Any lender would like to lend to the guy who can reasonable repay the money and there is decent consistency in the country economy and politics. With regard to india, whatever you have mentioned with regard to the develpment need are true. There is no denial to fool oneself. As you had mentioned in other thread of yours that the government aid are basically to export their own country products to donee. It is like an export promotion campagin nothing more. Conclude, india wants funds which the pm saves every day for its own development need and world bank has got money to borrow. There is no charity by ANYBODY. It is a mutually beneificial relationship. "In 2006 a commission appointed by the government revealed that Muslims in India are worse educated and less likely to find employment than low-caste Hindus." Pls go www.indianmuslims.in, you can read article about the average muslim income more than the hindu. Statistics can be used to interpret either way. Family planning - Government priveleges are only for the two children. First Cousin marriage - more children with special care. EDUCATED MUSLIM NEVER GO BACK TO THEIR SOCIETY TO BLEND THEM BETWEEN DEVELOPMENT & RELIGION IS THE GREATEST CURSE OF INDIANMUSLIMS. Who has to be blamed the society and its failed leaders who used their collective vote bank politics to nullify the alimony to a old woman rather than for economic development. If individual have more children, india is not oil rich middle east to doll out money. They have to be blamed for their state. Even god help people who helps themself. Failure of muslim leadership in my blog for refernce. 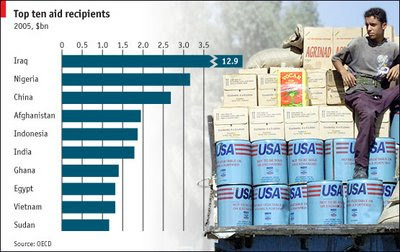 Even china is shown as receiving more aid. Fact of the matter is that china has the largest us reserves. So what is shown as aid is nothing but loan. Loan is always given to the guy who can return back. Anon: "As you had mentioned in other thread of yours that the government aid are basically to export their own country products to donee. It is like an export promotion campagin nothing more." The World Bank is not a country, it's a multi-lateral inst with the charter of "poverty reduction". India qualifies because it is home to more than third of the world's poor...a form of charity loan at very low interest rates to be repaid over a very long period. Anon: "Pls go www.indianmuslims.in, you can read article about the average muslim income more than the hindu. Statistics can be used to interpret either way." First Cousin marriage - more children with special care." First you say that Muslims are doing well and earning more, then you go on to explain why they are not doing well and blaming them for it. Are you contradicting yourself? Are you confused about your own arguments? What exactly are you saying? Please have clarity of thinking on these issues. I guess its a loan..rather than an AID which India is quite capable of repaying unlike Pakistan. Pakistan is past the rubicon and is a failed state..where Taliban and Pak Army has the same motto..jihad fisbillah..ha ha.. Your country will be in tatters in months..
India is in a growth trajectory and is consistently cutting down poverty albeit slowly. A feudalistic, bigoted, islamic people of a failed state advising a rising regional superpower is ironic. Jadev: "Your country will be in tatters in months.."
Is that why the world just pledged $ 5 billion in loans and grants to Pakistan ? Is that why the ADB and WB are loaning an additional $2 billion to Pakistan? Do they not expect to get repaid by Pakistan, as they do by India? Go figure! Your ill-will toward Pakistan and Pakistanis has never been a secret, Jadev! But remember, it's just your wishful thinking! Because the world is still loaning money to Pakistan, as it is to India. And they expect Pakistan to be around to repay. World bank has a capital and it would like to give the money to countries which will repay the loan with some small interest. It desist from giving loan to countries where the stability [ economically / politically ] is not sure. Otherwise they give loan. Further i have not said that india is not a poor country. India is a poor country but the multilateral organization is ready to give loan as we are repaying our existing obligations as per the agreement. wb put conditions for toll on road development and most of the project funded by wb funds operate on Build operation and transfer on the basis of toll by private sector. People have income to pay toll and in turn return money to WB. That is the question nothing else. I generally desist from getting into this argument but for your statement saying that muslims are not doing well in india in this thread. I can provide government source for both the above statements. Offcourse i can say with confidence an average muslim has more opportunities and freedom to grow in india than what is in pakistan. indian brahmin ruling elites have a blind spot for massive poverty in india. In some cases, it is worse than Africa. funny how it become headline in indian newspaper and gives erection to indian extremist whenever a third rate "analyst" in u.s. or euorpe who has never visited country predicts Pakistan's collapse again. According to this, Pakistan must have collapsed dozens time over! Riaz China is an even bigger beneficiary of "aid" (your own graphic). Your point may be valid - India's poverty-stricken masses blah blah - but your case is bogus. As Ejaz Haider (and Cyril Almeida) wrote - India has already solved the first-order issues of the state - it is a parliamentary democracy - and has built a broad consensus around that. It is grappling with the 2nd order issues - reducing poverty, increasing literacy, better health, infrastructure and more. You know what's left unsaid. Anon: "It desist from giving loan to countries where the stability [ economically / politically ] is not sure. Otherwise they give loan." Absolutely wrong. World Bank provides loans specially when there are political and economic problems, where commercial lenders do not want to lend. Its main objective is poverty reduction, not return on investment. Shouldnt you really be talking about AID per capita ? I mean India is home to 1/6th of the world, so comparing raw numbers does not give the true picture. In my personal experience and reading, I dont think it is poverty that causes instability in India. This is a mistake often made by western commentators. Instability mainly has to do with ethnic tensions and government repression (eg land acquisition), especially in the mineral rich tribal belt. If one would assume income inequality to be the main reason for instability then Mumbai would be a prime candidate for instability, but the city is relatively peaceful. The only riots that occured in the city were between Hindus and Muslims, most of the perpetrators were lower middle class men, not the extremely poor. "Smaller condoms are on sale in India. But there is a lack of awareness that different sizes are available. There is anxiety talking about the issue. And normally one feels shy to go to a chemist's shop and ask for a smaller size condom." But Indian men need not be concerned about measuring up internationally according to Sunil Mehra, the former editor of the Indian version of the men's magazine Maxim. "With apologies to the poet Alexander Pope, you could say, for inches and centimetres, let fools contend." Dear Riaz; the last comment by anon on April 20 @ 9:17 pm must be removed. You should have not let it published. This is not the time and place to post such things. I urge you to remove it or I will stop reading your blog. I am Pakistani and commenting from Middle East. Taliban is only 100 km away from islamabad. Day might be far when the taliban will be the ruler and the army might be working under them. Redemption look very bleak in this scenario on the face of it but for some miracle. Mr Zafar/Pakistani from Middle east, why you want that news to be removed, it’s a serious research study results, read carefully. Either way globally there is freedom of speech. You cannot dictate somebody else’s blog, Riaz can edit or delete on his own discern, the guy is highly educated, reformed, read his profile. Myself and Friends really are very impressed by his writings, he has enough fans. You sounded just like our former religious minister Maulana Kausar Niazi(director of Censor board).Common grow up, its no big deal, this news was legitimate about India, splattered all over the news, they did the study themselves to make awareness of massive condom failures causing overpopulation, increased poverty, more spread of AIDS. Do you think if these were the results from a Pakistani study, the world blogs would have stopped for a minute and ignored it? I failed to comprehend that you say" that this is not the place and time".Why? I think you have to read it again, with a more mature outlook. Pakistan like every country has set of issues, India and China their major and extremely serious issue in spite of their Industrial might is population issue, rather graphic study analysis, but that’s a major fact jack. @ Anon at 1; 36 am said: "Taliban is only 100 km away from Islamabad. Day might be far when the Taliban will be the ruler and the army might be working under them." That’s old news dude, if your definations of taliban is a hard working blue collar pakistani citizen, then they are definitely even less than 100 km from whatever cutoff point you want to mark, what’s your point, where are you getting these solid predications, because this dredful news would have been reported by somebody, are you sitting with binoculars in Islamabad watching them stationed in your own fantasy world, why this illogical stereotypical behavior, like every Pakistani guy with shulwar khameez, beared and turban you conclude is TALIBAN, is Taliban some country, any special culture, explain. Pakistan is certainly not a banana republic but is definitely suffering because of certain crazy fanatic remnants from soviet-afghan era. Guys like you, I bet you are not Pakistani are predicting, waiting, wishing since 1947 which is now a failed concept, as things have changed, Pakistan army is too strong, united and too patriotic, soon Taliban will be the one who will be wiped out cleaned. Some place its negotiating with diplomacy, some with firepower. Be patient, the movie has not ended yet, right bro. You guys are undying optimist, i bet. still believing that pakistan is not a failed state. Best of luck. With regard to taliban, still you have hopes on army. Army will quietly give way to taliban and be under them as they are smart not to fight a loosing battle. History buddy history. Pakistan army quietly they eft bangladesh when pak-army found that it cannot win the war as the local place [ muktibahini] was turning to grave yard. India never wishes the end of pakistan but pakistan from the day one wishes for the problems of india. India survived by gods wish and gods wish is more powerfull than being stooge of america [ pakistan for the last twenty years ]. I read an article where the state found by a staunch hindu [ gandhi ] is more secular that the state found by secular [ jinnah ]. @anon 7:33 pm said:” Pakistan army quietly they eft bangladesh when pak-army found that it cannot win the war as the local place [ muktibahini] was turning to grave yard." I find your statements ridiculous; first of all did you read about that war, what happened? India was involved all along. By the way why you are worried about Pakistan’s downfall, do you live in Pakistan or are you a Pakistani or its just plain hatred against a country because you have nothing else productive to do. How can you predict stuff, its amazing? Currently India is also a BIG stooge of USA too (after civil nuclear deal), enjoy their dictation, as soon Kashmir issue will be resolved, like it or not. Riaz, for once you have lost your respect as blogger. Apart from that you have turned into an ignorant perpetrator of news. Your news above is collection of facts but you have failed and in way succeeded in getting ignorant cowards of pakistan state on a bandwagon -I mean its misguided citizens are fooled-that includes me. For fifty years -Pakistan has been fooled by India enemy syndrome and even now when we need to hang our heads in shame for our indirect involvement of terrorism as state citizens of pakistan-we still like to shamelessly fool ourselves of Indias failures. Poverty is NOT as shameful as selling soul to religious cowards or turning a nation into religous hell!!!!!!!! DID YOU READ WHAT HILLARY CLINTON SAID TODAY???? ?--Our proud nation is the mortal threat to the world!!! To hell your long essay-when did India ever get such a bad name-shall we compare ourselves to Bangladesh??? The essay reflects your growing frustration at the inevitable fall of Pakistan to Taliban. I think you need to understand-at this age that to beg is not as bad as to kill.We belong to the second category-only we but there are many nations that belong to Indias category including China. You have contradicted yourself with this essay-the question now is any surprise why we are a failed nation-read your own blog yourself-please! @anon 6;30 pm said: "I mean its misguided citizens are fooled-that includes me." so any ingenious plan to counter all that, or plan to surrender your country honorabily.If people like you and others for once had one protocol in life for sake of god, things would have been much different.So stop reading Riaz's blog if you dont like it, all he is doing is trying very hard to clearly presents 100% reliable/logical arguments which shows his true patriotism.Maybe you should apply for Indian citizenship and that will make peace for you. It is love without conviction where nobody wants to spoil his hands to do a gandhi leaving his professional comfort to liberate his people something similar to moses. His ultimate sacrifice motivated the whole country. There is no use in blaming as after all it is jinnah who formed the country who neither sacrificed nor had religious belief to form the state for muslim. What else can you expect. "I find your statements ridiculous; first of all did you read about that war, what happened? India was involved all along. By the way why you are worried about Pakistan’s downfall, do you live in Pakistan or are..."
Iam so elated you feel that way, face it my man you have no choice but to enjoy your slum city and this headache.As you never left us alone since 1947, I still have fresh memories of 1971 Indo-pak/bangladesh war unprovoked started solely by India and your evil Indhra gandhi ( look how she died) for its permanent evil plans.Well Europe too should deal with it, what can we do they created these cave dwellers mountain, peanut brain, fanatic men for Soviet afghan war era residue,enjoy it baby with unfortunately us too.You deserve this uncertainity too as you Indians always have hidden agendas against Pakistan your twin cultural neighbour. @ anon who said: "There is no use in blaming as after all it is jinnah who formed the country who neither sacrificed nor had religious belief to form the state for muslim. What else can you expect. India was very a well governed nation under Muslims...far better than the pathetic governance you have today in "the largest democracy". The pre-British, early 19th century Moghul India, described as caste-ridden, feudalistic and unmodern, was economically ahead of the rest of the world,including Britain and the US, according to S. Gururmurthy, a popular Indian columnist. The Indian economy contributed 19 per cent of the world GDP in 1830, and 18 per cent of global trade, when the share of Britain was 8 per cent in production and 9 per cent in trade, and that of US, 2 per cent in production and 1 per cent in trade. India had hundreds of thousands of village schools and had a functional literacy rate of over 30 per cent. In contrast, when the British left, India’s share of world production and trade declined to less than 1 per cent and its literacy was down to 17 per cent. Incorrect if you say 'Muslim rule.' Under some of the Mughal rulers, yes. I have no doubt that Akbar, Shah Jahan and Jahangir were good rulers and India prospered under them and was also peaceful. Before and after, you had religiously intolerant idiots (best case Aurangzeb) who set the timer for the suicide bombing of the Mughal empire. Bahadur Shah Zafar was a great ruler too, but he came too late and was too old to save the empire's sunset. By the way, India was always a rich country even before the Muslims invaded. I appreciate the fact that at least the Mughals made India their home(unlike Mohammed Ghori, Nadir Shah and the Brits). This kept India's wealth from going out of country. And whats wrong with singing praises of India's parliamentary democarcy? With all its flaws, we still have the same consitution that we adopted in 1950 and have not had any dictators. The world's biggest democarcy just concluded its 15th parliamentary election - the grandest democratic exercise in history. India (along with China) has taken off the maximum people out of poverty during the past few decades. But thanks to our huge population, we have miles to go before we rest. According to Financial Times, when India's new government announced last week that it would accept aid from Group of Eight countries and other European donors, it took many donors by surprise. The previous government had restricted bilateral aid to six donors - UK, US, Russia, Germany, Japan and the EU - in a bid to style itself a donor rather than a recipient of aid. But last week New Delhi reinstated donors such as Canada, France, Italy and the Scandinavian countries. India receives about $5bn (€4bn, £2.8bn) a year in aid, mainly from the World Bank, the Asian Development Bank and Japan. Although it has increased the number of donors and invited aid packages of more than $25m a year, the new government led my prime minister Manmohan Singh has signaled it has not wavered from India's aim to "graduate" from needing aid to giving it. But it has so far failed to clarify the direction of its aid policy - an uncertainty that could damage India's efforts to be ranked as a permanent UN Security Council member. International development aid is one part of the UK budget unlikely to be cut in a squeeze on public finances. But questions are being asked about how aid is used, and which countries need it. India last year got almost £300m from the UK, some of it spent on toilets in the country's financial capital, Mumbai. The stench from the stagnant, fetid stream of the Queresh Nagar slum in Mumbai hits you as soon as you get out of the car. The slum itself is bustling and vibrant. There is a line of shops with living quarters above. The stream is behind, the water a murky grey with insects buzzing on top. Some residents have rigged up filthy plastic covers at the back of their homes for privacy. But the children scamper around using the stream, or whatever ground they can find on the disused rail track behind, for a toilet. "We have to live in these conditions," says La La Nawab Ali, who is showing me around. "What can we do? You can see the state of it. This is Mumbai." In another slum at Munjul Nagar, residents show letters, many signed with thumb prints, asking the authorities to finish building a toilet block that has been left half-finished. A similar stench pervades the air. "It's an extremely difficult and helpless situation," explains Prasad Shetty, an urban planning consultant. "It's an extremely embarrassing undignified demeaning kind of experience for them." Most of the funding for the sanitation project initially came from the World Bank and was then was taken over by the Mumbai government. A small amount of British aid goes from the UK Department of International Development (DFID) through charities in England and India, mainly to train people to maintain their community toilet blocks. But many in the slums say they know little or nothing about it. "You foreign people from over there, you keep on sending so much money," says one angry slum resident. "But the poor person sees nothing." For expansion of reach of primary school and the quality of engineering education, the World Bank has sanctioned two projects worth $ 1.05 billion (over Rs 4,800 crore) for India, reported PTI. “The World Bank today approved two education projects worth USD 1.05 billion for India, designed to boost the number of children enrolling in and completing elementary school, and to improve quality of engineering education across the country,” it was quoted as saying in a statement. He went on to reveal that India actually has its own foreign aid programme, called the “Indian Technical and Economic Cooperation” programme. It was launched in 1964 and now helps 156 countries, including Afghanistan. The bizarre situation has therefore arisen where British taxpayers give untold millions to India, whose government in turn dishes out foreign aid to other countries. “Many Britons feel that their country cannot afford to lavish £825 million on India over three years,” Mr Datta-Ray said, pointing out that the British taxpayer had already provided India with £1,045 million in aid over the previous five years. "According to the World Food Programme (WFP), India was its 15th largest donor in 2006, donating $52 million, much of it for Iraq and Afghanistan. First came the criticism that India should not be spending money to feed others, when its own citizens are starving or malnourished. Then came the counter-arguments explaining why malnourishment would not be solved even if India did not give food away. Both miss the real point. Endemic malnourishment in India as a criticism of India’s donations is no criticism at all. And to respond to it is to respond to the wrong criticism. Before I explain, some numbers on India’s economic aid program. Each year India accepts about $5 billion in economic aid, mostly from 6 major bilateral donors, as well as the World Bank, IMF and other multilateral donors. In 2000 India was a net recipient of WFP money. However, India also runs a small but long-established aid program of its own. In 2003, it became a creditor to the IMF (remember the 1992 balance of payments crises?). Early this year, India committed $50 million to Afghanistan, bringing total aid provided to over $600 million. In summer, India promised Nepal $218 million in economic aid, in addition to waiver of loans made for military supplies. Longer-term loans included $110 million to finance Indian exports in Africa, $500 million to West African nations, and help to Tajikistan to upgrade and operate the Farkhor Air Force base. Food aid distributed through the WFP is part of a larger economic aid program, and must be viewed as such. It comes from the Foreign Ministry, so it would only be spent on economic aid. The question therefore is not whether this money would be better spent on India’s hungry or on Iraq’s. Rather, it is whether this money would be better spent through the WFP or through bilateral aid programs. Put another way, is India’s aid allocation substantially sound? To answer that question, one must be clear on what economic aid achieves. Beyond the merely philanthropic, economic aid generates direct benefits, often through conditionalities such as political or economic favors. This is best done through bilateral aid. Second, indirect benefits include goodwill and greater legitimacy and power, particularly in multilateral fora such as the UN and WFP." India giving food aid seems to be akin to a shoemaker's children having no shoes to wear. To answer the oft-repeated question of the difference between aid and soft loans, the answer is that most of what is called foreign aid comes in the form of soft loans from donor nations and IFIs such a WB and IMF. [QUOTE]New Delhi, March 10 Japan on Monday agreed to extend soft loans amounting to Rs 7,074 crore for seven large-scale projects including the Delhi MRTS Project (Phase-II), Hyderabad Outer Ring Road project and the Hogenakkal Water Supply project in Tamil Nadu. The concessional loans under the Official Development Assistance (ODA) package would be made available through the Japan Bank for International Cooperation (JBIC). The total soft loan committed by Japan for financial year 2007-08 stood at Rs 8,582 crore if the Rs 1,345 crore loan package committed in August 2007 was also counted. The Exchange of Notes were signed and exchanged between Mr Hideaki Domichi, Ambassador of Japan to India, and Mr Kumar Sanjay Krishna, Joint Secretary in Finance Ministry, on behalf of their respective Governments, in the presence of the Union Finance Minister, Mr P. Chidambaram, here today. Gridlocked in corruption, greed, inhumanity and absolute inequality – of class, caste, wealth, religion – this is the Real INDIA. Hindutva Idiots, Your false pride and actions make our life miserable. According to Indian news media, Japan has agreed to provide an Official Development Assistance (ODA) package to India in the form of soft loans amounting to more than Rs 10,500 crore (Yen 215.611 billion) for the financial year 2009. An official press release said the notes in this regard were exchanged between Dr Alok Sheel, Joint Secretary, Department of Economic Affairs, and Mr Hideki Domichi, Japanese Ambassador to India here this morning. The release said the loan would fund six major projects, including Rs 4422.84 crore (Y 90.62 billion) for Phase I of the Dedicated Freight Corridor (DFC) project. The total cost of the project appraised by the Japan International Cooperation Agency (JICA) is Y 498.565 billion and the Government of Japan has committed Y 92.868 billion for Phase I. The project is aimed at coping with the increasing demand for freight transport in India by constructing a new dedicated freight railway system, thereby promoting comprehensive regional economic development along the freight corridor, through improvement and modernization of inter-modal logistic system handling considerable freight traffic and poised for massive growth. The package also includes a loan of R 2932.70 crore (Y 58.851 billion) for the Chennai Metro Project, which has been appraised by JICA at Y 378.138 billion. The Government of Japan has committed Y 21.751 billion for Phase I and Y 59.851 billion for Phase II of the project. The project is designed to cope with the increasing traffic in Chennai metropolitan area by extending the mass rapid transportation system. It is expected to promote regional economic development and improve the urban environment through mitigation of traffic jamps and decrease of pollution caused by the increasing number of motor vehicles. The assistance package includes a loan of Rs 1648.36 crore (Y 33.640 billion) for the Delhi Mass Rapid Transport System Project (Phase II). The total cost of Phase I of the project was appraised by JICA at Y 274.612 billion and the Japanese government has committed Y 162.751 billion. The total cost of Phase II of the project has been appraised at Y 388.670 billion and the Japanese Government has committed Y 211.976 billion. The first phase has been completed and the second phase is being implemented. There is a Rs 1146.75 crore (Y 23.403 billion) loan for the Kolkata East-West Project Phase II. The total cost of the project has been appraised by JICA at Y 140.199 billion. The Japanese government has committed Y 6.437 billion for Phase I and Y 23.403 billion for Phase II. The package also includes Rs 263.82 crore for the Sikkim Biodiversity Conservation and Forest Management Project and Rs 150.53 crore for the Rengali Irrigation Project. With today's Exchange of Notes, the cumulative commitment of ODA from Japan has reached Rs 155840 crore (Yen 3116.81 billion). India continues to be the highest recipient of ODA from Japan. Attitudes toward aid in India are very different than in Pakistan. Indians accept aid, but they do not want to talk about it. In 2009, the Indian government banned the import of Plumpy'Nut nutrient bar by UNICEF to treat moderate to severe acute malnutrition among Indian children, according to BBC. Defending the government action, Mr. Shreeranjan, the joint secretary of the Ministry of Women and Child Development, told the Reuters that "Nothing should come behind our back. Nothing should be done in the name of emergency when we have not declared an emergency." In the aftermath of Kashmir quake in 2005, the Indian govt refused offer of tests from overseas, even though thousands were left out in the cold for weeks after the disaster, according to NY Times. Pakistan's approach has been exactly the opposite. Hit a whole lot harder by the Oct. 8 quake - its official death toll stood at 42,000 on Tuesday- Pakistan has appealed for worldwide help and allowed foreigners to travel to its side of Kashmir and to the traditionally well-guarded pockets of North-West Frontier Province, the two areas that suffered the greatest damage. There is no agreement on whether India has sufficient tents to care for its own. The Foreign Ministry spokesman said the Indian Army would be able to help make up the shortfall. The army spokesman in Kashmir, Lt. Col. S. K. Batra, cautioned that the military, itself badly hit in the earthquake, could not entirely deplete its own stock. The government's joint secretary of disaster management, Aseem Khurana, vowed that enough tents would be sent within a week. So far, roughly 13,000 of the 30,000 tents required have been distributed, he said, slightly less than half sent by the Indian Army. Talking about begging, India is a much bigger beggar than Pakistan. Each year India receives about $5 billion in economic aid, mostly from 6 major bilateral donors, as well as the World Bank, IMF and other multilateral donors. In 2000 India was a net recipient of WFP money. However, India also runs a small but long-established aid program of its own. India has decided to stop receiving British aid starting in April, 2011. This is a pre-emtive move by India because the Brits had told Indians they were going to announce cuts in aid anyway as part of budget cuts in London. This aid cut will hurt India's poor the most with less food and even fewer toilets for their growing numbers. The External Affairs Ministry has instructed the Finance Ministry to inform London that India will not accept further aid from next April. Last week, Foreign Secretary Nirupama Rao told the ministry that “internal discussions” within UK’s Department for International Development — which accounts for over 80% of all bilateral aid to India — were “to limit the aid further and channelise it to specific projects of their choice in certain states instead of routing it through the Central government”. “Rather than wait for such a situation to develop... it would be better if our decision not to avail any further DFID assistance with effect from 1st April 2011 could be conveyed to the British side in an appropriate manner at the earliest,” she wrote to Finance Secretary Ashok Chawla. Here is a country which, as Andrew Mitchell, the UK secretary for international development, puts it, "is roaring out of poverty". It is the 11th largest economy in the world. It is spending $31.5bn on its defence budget and $1.25bn on a space programme. So why, in these cash-strapped times, is the British government giving aid to India? This issue will be considered by the UK parliament's select committee on international development this week, and is likely to prompt some discussion on the blogosphere (Andy Sumner, from the IDS has blogged on it). It is a key question in the international development department's internal review – which is due to be published shortly – and there has even been some speculation in India that the UK deliberations could be shortcircuited by India itself deciding it no longer wants British aid. This should be a straightforward issue – but beware, it's no such thing. One key expert admitted to me that they change their minds from backing to ending aid to India every other day. Nor is it a trivial issue. Since 1998, India has received more British aid than any other country, a total of £1.5bn in the last five years. India counts as one of 22 UK priority countries in its aid programmes. A lot of money is at stake. For a group of Conservatives, India is a prime example for their "charity begins and ends at home" approach. When Mitchell came into office, he made great fanfare about cutting aid programmes to China and Russia; allegedly, some in his department wanted to add India to that list but No 10 prevailed. India is still regarded by the UK public as a poor country, despite its recent economic growth and global power. And the truth is, that perception is absolutely accurate. A third of the world's poor live in India – more than all those designated as poor living in sub-Saharan Africa. Shockingly, half of all Indian children are malnourished. This poverty is concentrated in just four Indian states, which account for one-fifth of the world's poor. So if aid is about relieving poverty, UK aid to India is entirely justified. Some hopeful observers point to a new determination on the part of India's ruling elite to tackle poverty. Sonia Gandhi recently chaired a two-day seminar with the US economist Joseph Stiglitz on how to provide universal "social policy coverage" – basic services in health and education. It was a point made by Gordon Brown in his book Beyond the Crash, when he wrote about the new statutory rights to food and to primary education. But there is a long way to go, and the sharp inequalities in India present a stark dilemma for those in charge of aid budgets. As many developing economies grow, more and more of the world's poorest are in middle-income countries. As Sumner has pointed out in his argument on the new bottom billion, 72% of the world's poorest are in middle-income countries. It seems the British press loves asking this question with a fair amount of regularity lately. Just today the Telegraph reported that Prince Charles’ charity is spending a few million pounds on building eco-friendly homes for 15,000 slum-dwellers in India. Meanwhile the Guardian is wondering whether India will make a bold and symbolic statement by refusing the 250 million pounds in aid it receives from the UK annually. Here is a country [India] which, as Andrew Mitchell, the UK secretary for international development, puts it, “is roaring out of poverty”. It is the 11th largest economy in the world. It is spending $31.5bn on its defence budget and $1.25bn on a space programme. So why, in these cash-strapped times, is the British government giving aid to India? If only India’s 400+ million people living in dire poverty could learn to subsist on a diet of ammunition and rocket fuel. So why has the Government just changed its mind, and decided to give £1 billion in aid to India over the next three years, making in the largest single recipient of our largesse? At a time of cutbacks I struggle to understand the case for increasing aid even to the poorest countries. In the case of India, I find it impossible to grasp why we should think it desirable to shell out £1 billion to the fourth- largest economy in the world. Could it be post-colonial guilt? If so, it is misplaced. When Britain left the country in 1947, India was the 12th-largest industrial power in the world, and had the most extensive railway system in Asia. It was the semi-socialist policies applied for the next 40 years that held India back until free market reforms began to transform it. Perhaps Mr Obama knows something I don’t, but I wasn’t aware that in the Twenties and Thirties the Raj employed a huge secret police force and used widespread torture. Andrew Mitchell, the International Development Secretary, denied this was a motive during an interview yesterday morning on Radio 4’s Today Programme. I hope he meant it. India will trade with us if we are able to produce goods and services which its people want to buy. More likely, there is an outdated sense that it is our duty to disburse funds to the supposedly less fortunate — rather like an impoverished parent continuing to subsidise children who have grown much wealthier, and are more than capable of getting by on their own. I suspect that giving so much money makes us feel more important than we really are. No one disputes that, despite its phenomenal growth, India still has countless millions of poor people, though many fewer than it used to have. Its population, after all, is many times greater than ours. But despite its challenges with poverty, it spends some £20 billion a year on defence, not much less than Britain, and is a nuclear power. It also splashes out about £1.5 billion a year on its space programme, a luxury which this country cannot afford. Arguably India should be spending less on defence, and nothing on its space programme, and be diverting more funds to the alleviation of poverty. But the country is a democracy, and its government will be held to account for the decisions it makes. It is hardly our business if India wants to spend so much money on a space programme. But surely it is madness for us to be channelling precious funds to a country which chooses to have prestige projects that are beyond our own means. It was the Tories, not the Lib Dems, who decided that international aid should not only be ‘ring-fenced’ but increased by a third to £11.5 billion by 2015 while domestic budgets, apart from the NHS, are being slashed. This was a controversial decision in view of the ineffectiveness of much development aid, not to mention the corruption that sometimes surrounds it. India, although a democracy, is by no means corruption-free. A report by the country’s auditor general, seen by the Mail last September, revealed widespread aid abuses, including wasting money on thousands of colour televisions and computers that were never used, and several instances of fraud amounting to millions of pounds. London, Feb 16: The UK government today said it was making changes to its aid programme to India following popular anger that helping one of the fastest growing economies in the world is “unjustifiable”. “From now on in India we will focus our support on three of the poorest states,” said Chris Mitchell, the international development secretary. Bengal will be cut out for Britain considers Orissa, Madhya Pradesh and Bihar to be the poorest states. Speaking during “International Development Questions” in the House of Commons, Mitchell was forced to respond to critics such as Tory MP Philip Davies. “India spends 36 billion dollars a year on defence, 750 million dollars a year on a space programme, has one of the fastest growing economies in the world and is developing its own overseas aid programme,” said Davies, who represents Shipley. “Many of my constituents, given that we are having to cut public expenditure in this country, will think such aid to India is now unjustifiable.” UK aid is worth £280 million a year for four years. Some MPs spoke up for the need to continue with the aid, among them Labour’s Barry Gardiner whose constituency of Brent North in north London has many people of Gujarati origin. He argued the help was “vital” and told the Commons a quarter of the world’s poorest people lived in India. The children’s charity body Plan International also defended British aid to India. “The fact that eight Indian states account for more poor people than in 26 of Africa’s poorest countries combined shows there’s a need for aid in India,” its head of advocacy Adam Short said. Marxist economist Lord Meghnad Desai could be relied upon to take a distinctive line. The government is expected to freeze the level of assistance given to India at £295m ($480m) a year. But why does a nuclear power with its own space programme need British aid? In a widely-signalled move, it is anticipated that International Development Secretary Andrew Mitchell will announce the amount of aid given to India will be maintained at 2009/10 levels. But the decision has attracted criticism from newspapers and politicians who say the UK taxpayer does not need to donate to a state that is itself a foreign aid donor, which is classified by the World Bank as a middle income country (MIC) and whose economy is growing at nearly 10% a year. However, advocates of aid say a third of the planet's population who are below the World Bank's extreme poverty line live in India. They also argue half of all children in the country are malnourished and it does not have the tax base to eliminate poverty though internal wealth redistribution. Andy Sumner of the Institute of Development Studies says: "If UK aid was reduced, there is no guarantee that the funding to the poorest states where most of India's chronically poor live would be topped up by the Indian government." Although the Department for International Development's budget has been unaffected by the government's spending cuts programme, the UK is expected to stop direct aid to 16 countries, including Russia, China, Vietnam, Serbia and Iraq. Britain is to stop sending direct aid to Burundi and Niger, two of the world's poorest countries, the government announced as it unveiled plans to rebalance the £8.4bn international development budget. The two African nations, which are ranked second and fourth respectively in a World Bank list of the world's poorest states, are among 16 countries that will no longer receive bilateral aid from Britain by 2016. Direct aid will also be halted to Lesotho which is ranked 28th on the World Bank list. Burundi, a landlocked country in the unstable Great Lakes region of Africa, is still suffering from the consequences of the Hutu-Tutsi massacres in the 1990s when 200,000 of its citizens died. Niger, a landlocked country in west Africa, depends on foreign aid for half of the government's budget. The cuts were outlined to MPs by Andrew Mitchell, the international development secretary, as he unveiled the conclusions of two reviews into Britain's bilateral and multilateral aid programmes. Cutting aid to the 16 countries would allow Britain to concentrate its resources on 27 countries which include Afghanistan, Pakistan and South Africa. Ethiopia will become the biggest recipient of bilateral aid over the next two years. Pakistan could become the biggest recipient of British aid within three years, with a major focus on education, British officials in Islamabad said, but only if the government reduces chronic corruption. Just 56% of Pakistani children between five and nine years' old attend primary school, a rate that British officials want to boost to the world average of 87%. But the school system is chronically dysfunctional due to political interference, "ghost schools" and unqualified teachers. "It's an education emergency," said one official. As well as reducing graft, British officials want to see Pakistan increase its tax collection, currrently at a disastrously low rate of nine per cent of GDP with many parliamentarians paying little tax. The Pakistani government has vowed to improve education spending from two per cent GDP to seven per cent. British officials said they recognised that British aid was a "drop in the bucket" in a country of 180 million people, but hoped that a targeted aid programme could "catalyse change" in critical areas like education. Direct financial transfers to the Pakistani exchequer, which amounted to £120 million over four years under the last aid programme, are likely to be scrapped, officials said. India depends heavily on foreign inflows to survive, given its huge and perennial trade, budget and current account deficits. India is the biggest borrower from multi-lateral lending institutions. According to the statistics of World Bank, India has become the largest borrower from the International Development Association (IDA), a component of World Bank Group which helps the poorest countries of the world. Among the bank’s FY10 Top Ten IDA borrowing countries, India tops the table with $ 2,578 million, followed by Vietnam ($ 1,429 million), Tanzania ($ 943 million), Ethiopia and Nigeria with $ 890 million each, Bangladesh ($ 828 million), Kenya ($ 614 million), Uganda ($ 480 million), Democratic Republic of Congo ($ 460 million) and Ghana (433 million). IDA, termed as ‘Soft Loan Window’ of the World Bank, was established in 1960 with the aim to reduce poverty by lending money (known as credits) on concessional terms. IDA credits have no interest charge and the repayment period ranges between 35 to 40 years. IDA is the largest sources of assistance for the world’s 79 poorest countries, 39 of which come from Africa. Not only with IDA, India is also the third largest borrower of the International Bank for Reconstruction and Development (IBRD), a part of World Bank group with a total loan of $ 21.9 billion which have financed 77 projects in the country. Among various states in India, Tamil Nadu hold the maximum assistance of $ 2.1 billion from the World Bank to support its six on-going projects. With 3.3 million registered NGOs, India's nonprofit sector raises between $8 billion and $16 billion in funding every year. According to Home Ministry statistics, foreign funding to Indian NGOs saw a 56% increase in the 2005-06 and 2006-07 fiscal years. In 2008, the latest available data, the total official foreign aid to India was $2.15 billion. Pakistan’s contributions to mitigate the suffering of the countries hit by natural calamities are not only commendable but also helped Islamabad a lot to safeguard its economic interests. Sri Lanka, China, Iran, Nepal, Maldives and Afghanistan are the countries where Pakistan did a lot on humanitarian front and also managed to keep its say in the said countries. As far as Afghanistan is concerned, Pakistan during the Musharraf regime announced the $300 million (over Rs 25.5 billion) grant for various projects out of which Pakistan has so far doled out $ 175 million (Rs 12 billion) since the announcement of the then President Pervez Musharraf during his visit to Kabul. However, in 2009-10, according to Additional Secretary at Finance Ministry Mr Rana Asad Amin, Pakistan provided Rs 2 billion to Afghanistan to complete the various projects. Likewise, Rs 2.5 billion each allocated to Afghanistan in 2010-11 and current financial year 2011-12. And in the future Pakistan will keep on doling out the amount to Afghanistan under the pledged $ 300 million grant. The Emergency Relief Fund Data is an eye opener for those who deem Pakistan did not play its role on the humanitarian front which is vital to keep its economic interests intact. According to Emergency Relief Fund data, Pakistan in 2003 donated Rs 53.9 million in the shape of kind in to to to four countries that include Rs 1.72 million to Sri Lanka for flood victims, Rs 10.9 million to Algeria for earthquake victims and Rs 2.6 million to China for fight against sars and Rs 38.7 million to Iraq for war victims. In 2004, Pakistan again donated Rs 171 million in kinds to four countries that include Rs 140.8 million go Iran for earthquake victims, Rs 3 million for Sri Lanka for drought victims, Rs 9.8 million to Afghanistan for food shortage and Rs 18.2 million to Bangladesh for flood victims. However, when catastrophic tsunami badly hit Sri Lanka, Indonesia and Maldives in 2005, Pakistan came up with a bang and helped the said countries on big way and donated Rs 668 million for the said three countries. In addition Pakistan also extended the donation of Rs 26.3 million in kind to Comoros in the head od food assistance. In 2006, Pakistan bequeathed Rs197.8 million to three countries including Rs 7.7 million in kind to Iran for earthquake victims, Rs 92.2 million to Indonesia also for earthquake victims and Rs 97.9 million to Lebanon for war affected people. In 2007, China was provided Rs 1.875 million in kind for flood affected people, Bangladesh given Rs 72.19 million for cyclone affected people. However, Pakistan in 2008 donated Rs 5 million to Myanmar for cyclone affected people, and Rs 160.503 million to China for earthquake affected people and Rs 1.153 million to Nepal for flood victims. And in 2009, Pakistan provided Rs 33.338 million in kind to Palestinians of Gaza. In addition, in 2008, Pakistan also provided Rs 81 million in kind to Cuba for hurricane affected people. As far as Pakistan’s authorities are concerned, they managed to ink trade deals with China and Sri Lanka with which Pakistan also possess the in-depth strategic relations. Ambassador of Japan to Pakistan Hiroshi Oe on Sunday said "National Transmission Lines and Grid Stations Strengthening Project" of Japan worth Rs30 billion, will help Pakistan save electricity used in about 2 million average households. In an interview with APP, he said Pak-Japan project, soon after its completion, will help Pakistan in overcoming its growing energy demand. About the major projects initiated by the Japan government, he said that Japan has been a major contributor to the development of social sectors in Pakistan. Japan's assistance to Pakistan has added up to 1.3 trillion yen (approx. 1.5 trillion rupees) since 1954, the ambassador said. Japan has provided technical assistance to Pakistan by receiving trainees under the Colombo Plan and provided technical training or study opportunities to over five thousand Pakistanis in Japan, he added. He said Japan has built up about 530 schools and 130 hospitals, clinics and provided medical equipment under various Japanese assistance programmes. To a question, he said about 30 Japanese companies are operating in Pakistan including joint ventures with Pakistani companies related to automobiles, motorcycles and service industries such as constructors, IPPs, financial institutions and trading houses. Considering the vast potentials in Pak-Japan bilateral relationship, he said there is much more work to be done, and therefore, he cannot be complacent about the current status of ties. Highlighting the need to enhance the potential of manpower in Japan for Pakistani youth, he said trade opportunities with Japan must expand and interactions with Japan will surely provide vast opportunities to the youth of Pakistan. To a question, he said Pakistan is an important partner in the area of parliamentarians' exchanges. Both the countries have Japan-Pakistan friendship groups respectively, consisting of parliamentarians from each country, working to enhance their regular interactions. In September 2011, when the Japanese Parliamentary League for Polio Eradication visited Pakistan, they discussed the need for promoting interactions between parliamentarians of the two countries during their meeting with Pakistani parliamentarians, he said. The ambassador expressed his determination to make utmost efforts to further strengthen bilateral relations between the two countries, focusing on the promotion of parliamentarians' exchanges of our two countries. About the Pak-Japan cultural ties, Hiroshi Oe said Japan Embassy holds cultural events such as Ikebana workshop and demonstration, children's art and speech competition and Japan film festival throughout the year across the Pakistan. The ambassador said JICA has been helping National Institute of Science and Technological Education (NISTE) to train science teachers who will surely play a vital role in utilizing Japanese technology in Pakistan in the future. He said that he visited Sialkot last year and found the world's top-class manufacturing industries there. He hoped that with proper quality control and marketing, Pakistan will develop even more industries of such standard. The year 2012 is the 60th anniversary of the establishment of the diplomatic relations between Japan and Pakistan,the Ambassador added. Hiroshi Oe emphasized on promoting human and cultural exchanges to deepen mutual understanding between the two countries and expressed wish to work with the Pakistani government to further deepen the bilateral cooperative relations. I agree with you that these half-baked, poorly-educated Indian Code Coolies have a vastly exaggerated opinion of themselves and their dirt-poor country. But we must be more understanding of why they are like that. As the French say, "to understand is to forgive". What we are witnessing is called the "OVERCOMPENSATION" syndrome. In effect, they are so ashamed of the poverty of their parents that they tend to overcompensate by showing-off (conspicuous consumption) their newly acquired wealth (however little that might be). They are also so ashamed of the backwardness and illiteracy of their country, that they overcompensate by exaggerating their country's achievements. There is nothing unusual about all this, as this is just a part of human nature everywhere. It has been extensively studied by Sociologists & Psychologists all over the world. In fact, you will see the same behaviour amongst 1st and 2nd generation Mexicans/Central-Americans in the US, especially when they come from uneducated and poor family backgrounds. You could even say the same of the hyper-nationalist, loud Chinese from Mainland China who irritate the hell out of the people in Hong-Kong. Now that we have understood why they are like that and why they irritate everybody else, we can be more forgiving and just ignore the lound noises coming from these empty Indian vessels. Kuttay tau bhownktay hain, Hum kutton par kyon bhownkay? This is why the Western Countries have more say in Sri-lanka, Bangladesh, Pakistan & Nepal, while they have very little say in India. These are the facts. I am not comfortable with twisting the facts, even if the intention of twisting them is to prove the truth. The ends are important, but so are the means. We must not fall into the temptation of trying to establish the truth using prevarications-- that never works in the long run. I will leave you to ponder this issue. This indicates that our country is even more dependent than Bangladesh on foreign Aid for capital formation (internal investment). This seemingly strange situation arises from the fact that our Gross Domestic Savings are much lower than in Bangladesh. This indicates that our GOVERNMENT is almost just dependent as the Bangladesh Government on foreign Aid for meeting its expenses. Again, note the effect of the policy of "non-alignment" on the Indian Goverments lack of dependency on the West-- this is something we did not do because Ayub aligned himself with the Western Countries for the sake of free money. I will leave you to reflect on all of this. Former United Nations chief Kofi Annan has backed calls for Britain and the EU to stop giving millions of pounds in aid to wealthy countries. He said booming nations such as China, Brazil and India should wean themselves off development funding so it could be targeted at ‘weaker’ parts of the world instead. His comments come after International Development Secretary Justine Greening called for the European Union to stop giving aid to relatively rich nations. She travelled to Luxembourg last week to say it is wrong that the EU’s aid fund, to which the UK contributes more than £1billion a year, sends money to relatively rich countries such as Barbados, Iceland, China and Brazil. Conservative backbenchers want to see the Coalition drop its pledge to increase spending on foreign aid year-on-year, while cutting funding in every other department apart from the NHS. In 2014, taxpayers will be forking out £12.6billion a year on foreign aid – more than the £12.1billion it will be spending on the police. Mr Annan, a Ghanaian who was the UN secretary general from 1997 to 2006, said not all the countries who received aid from British taxpayers needed it. ‘The emerging markets and the countries that are doing well should wean themselves off aid,’ he said. ‘Countries like Brazil, China, India, Ghana, Guatemala and Honduras; some of these countries can fend for themselves. ".....emerging market countries, including India, have themselves become donors to more impoverished countries. Before a visit this week from President Hamid Karzai of Afghanistan, aimed at wooing investment, India approved development projects in Afghanistan to the tune of $100 million as part of India’s $2 billion aid package to the war-torn country. In 2010, the country extended a $1 billion line of credit to Bangladesh, the highest ever one-time assistance, and last year, it offered $5 billion in credit to African nations. With a broadening aid portfolio, New Delhi recently announced plans to set up its own aid agency. For India, once the world’s largest foreign aid recipient, with some $55 billion funneled to the country between 1951 and 1992, the change from recipient to donor comes as the country tries to redefine its role in the international community...."
Our aid dependency is still much higher than neighboring countries. FOREIGN AID Pakistan has received enormous amounts of foreign aid over the last half century or so. Both in per capita terms in constant dollars and as a percentage of Gross National Income the net official development assistance was at a peak in the 1960s but has continued to decline as repayments on all except grant aid have naturally continued to climb. Even so net ODA during the last decade was 1.7 percent of GDP close to 10 percent of gross fixed investment. As the following table shows relative foreign aid availability in relation to national income in Pakistan compared to that in India was fourfold in the 1980s and during the last decade the difference has grown to more than eightfold. The more important point is that aid flows are no longer significant in India for sustaining its quite high rate of investment and growth whereas Pakistan's growth and investment are in serious doldrums and the country is far from reviving sustained high growth on its own. The more serious problem has been that large external flows (foreign aid in the 1960 and 1970s, worker remittances in the 1980s, resident foreign currency deposits in the 1990s and direct private investment in 2003-08) reduced incentives for export development on the one hand, and on the other hand enabled policymakers to avoid difficult choices between consumption and savings. Judging from the long-term trends of gross capital formation, and the foreign savings available to finance the current account balance of payments deficits it would appear that gross national savings that averaged 14-15 percent of GDP in 1980s and first half of 1990s have shown no clear upward trend. After a brief spurt over 20 percent of GDP during 2002-4, the gross national savings have dropped almost steadily since then and touched a low level of 13 percent of GDP in FY 2012. The data, which is inflation adjusted, shows India received approximately $65.1bn in economic assistance from 1946 until 2012, followed closely by Israel, which was given $65bn. With $44.4bn received as economic assistance from the US, Pakistan is also among the top five countries to receive economic assistance out of a total of 200 countries and regions. Indian economic aid is spread out over various sectors and programs, including child survival and health, development assistance, HIV/AIDS initiatives, migration and refugee assistance, food aid, and narcotics control. 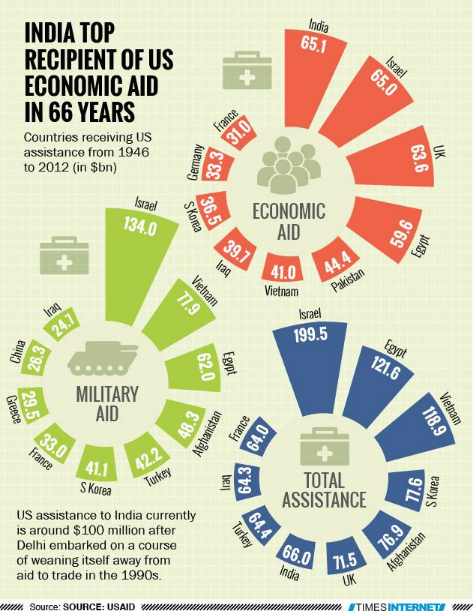 The bulk of this aid ($26bn) is provided to various USAID programmes. A majority of Israel's $65bn economic assistance was given to its Economic Support Fund and Security Support Assistance, with $56.5bn alone attributed to these programmes. In comparison, of the $44.4bn provided to Pakistan in economic assistance, $13.8bn is given to USAID programmes, while $13.7bn is attributed to the Economic Support Fund and Security Support Assistance. Israel received $134bn in military assistance over 1946-2012 ─ a figure which far outnumbers military assistance provided to the the second entrant on the list, Vietnam, at $77.9bn. Pakistan just misses being on the top 10 list, coming in at twelfth place with $12.9bn in military assistance from the US. India, however, is placed at 47 out of a list of 193 countries, receiving $897 million in military assistance. It is pertinent to mention here that Pakistan received most of the military assistance from the US during the superpower's involvement in Afghanistan during the 1980s and then after 2001. The US non-military aid to Pakistan for the period 1991-2001 averaged just $75 million per year, while the total military aid during the eleven-year period was a paltry $7 million.